The new Creative Director for RMK is Kaori, who is based in both New York and Japan. After arriving in the US in 1998, she worked as assistant to top makeup artists such as Gucci Westman and Pat McGrath. Kaori did the ad visual for the forthcoming autumn 2013 collection, Autumn Layering Colors, while the products were created by Rumiko. The collection will feature a new Ingenious Cream & Powder Eyes (5 variations), as well as blushes, lipsticks, lipglosses and nail polishes. Kaori will be responsible for creating the products for the Spring 2014 collection. Pic below from Maquia. The Ingenious Cream & Powder Eyes look like a reformulation of the Dusty Bright Eyes. The overly Photoshopped ad visual does not look very appealing to me as the ghostly pale unreal skin texture looks too Twilight-ish. 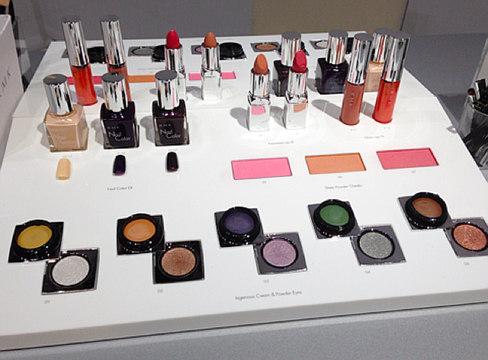 I do love RMK foundations and point makeup - I hope the new Creative Director adds some inspiration to the color line! Hi Haru, I just try my luck today to check on your website if you've returned to blogging again and you can't imagine how happy I was now. Thanks for blogging again coz I really missed your posts. This is my first time commenting here although I was your silent reader for more than 4 years. I hope RMK can step up its game, seeing as how Addiction has really raised the bar!